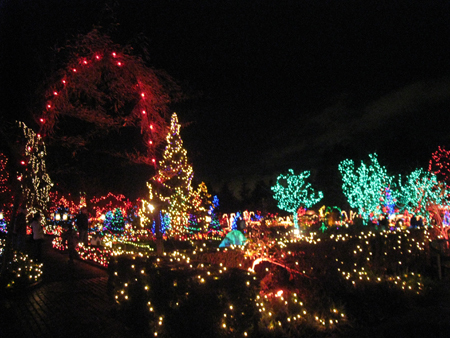 Earlier in December, when VanDusen Garden’s Festival of Lights had recently started, my mom and I went to go stroll in the garden and look at the lights. Because the actual botanical part of the garden isn’t very spectacular this time of year (what? rain? winter? nawwww) they have the annual Festival of Lights. It’s been some years since we’ve gone and they’ve certainly stepped it up! It used to be just mediocre before, and I don’t remember it being so expensive (but according to mom it has). Anyway, it was spectacular!! 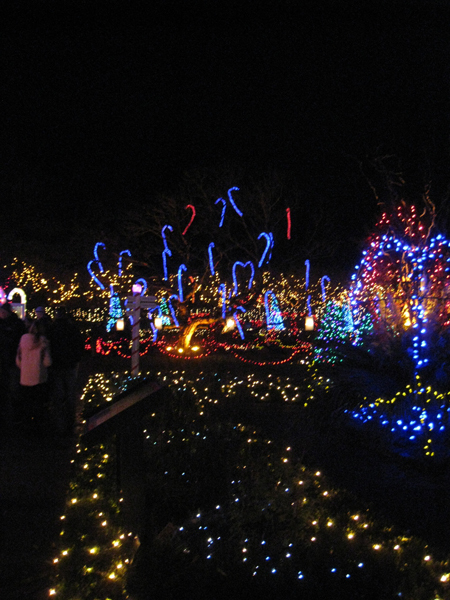 Here are some photos AND a video of the dancing lights show that occurs every half hour on the island in the middle of the gardens. The Candy Cane Tree! They were brilliant, just paper tubing that would be used for some sort of air duct. 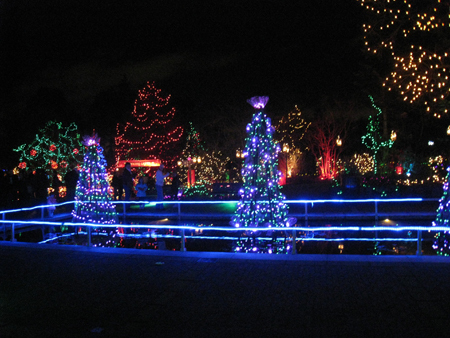 One of the decorative water spaces. It is directly below the area where the choir is and the regular entrance. This serves as a meeting area when large groups (such as Elementary Schools like we did) visit the Gardens. The holly berry tree! It’s brilliant when you’re standing far back from it. Totally looks like a holly bush. Also, look close up front, those “flowers” or “tulips” are actually chopped up water bottles! They look fantastic with just a bulb on a stick. Afterwards we walked through several areas and I started noticing how much recycled materials were a part of the display. It was great — tons of bottle-flowers of all shapes and sizes! My camera battery died shortly after — it does the stupidest thing, it will show 2 bars for the loooongest while, then it’s down to one bar, flashing red, and you have about 10 more minutes of juice left. So I was basically screwed and we’d not even seen half the garden! In a way I suppose it was good, it forced me to just enjoy myself and not focus on getting fantastic photos. However you, my blog visitors, missed out on the Gingerbread Woods with mushrooms made of lights, gingerbread men, gingerbread reindeer, and a candy cane lane! 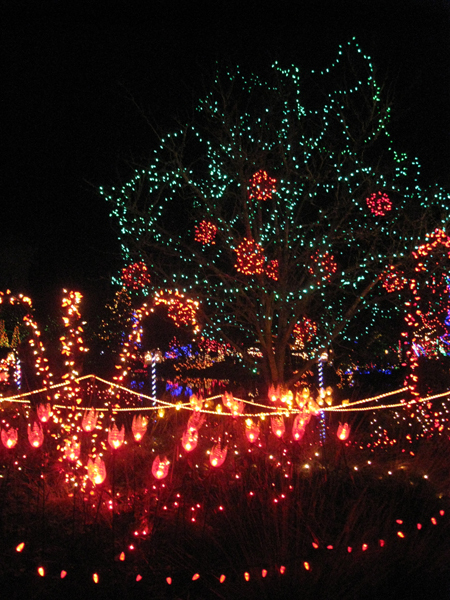 And more light displays in general. Now, similar to a movie theatre (and also $11 entrance), you’re hooked to get hot apple cider, roasted nuts, gingerbread waffles, hot cocoa from Mrs Clause’s kitchen, popcorn, and a variety of other holiday goodies. For the kids, there is also Story Reading with Santa until the 24th of December. From the 26th to the 4th of January (closing) there is a Magician for the kids, because Santa is at home resting with Mrs Clause and the reindeer.